After the final whistle blew on a killer loss for the Rams, one they could have, maybe should have had to start the season an unlikely 1-0, tempers boiled over a bit. 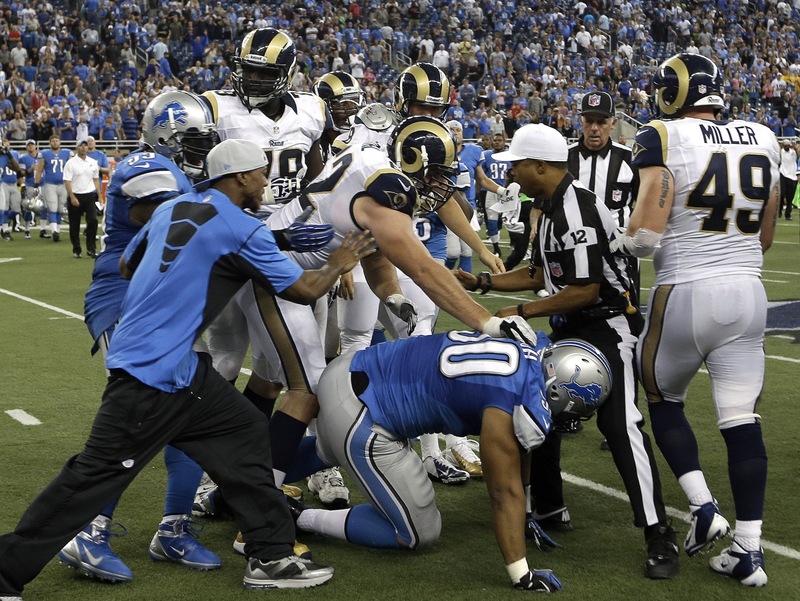 Rams guard Harvey Dahl shoved Ndamukong Suh to the ground, everyone started pushing, and shoving, and "hold me back, bro"-ing. It was quickly contained by their teammates and the replacement refs, who just wanted to get back to their hotel without a debacle. Meanwhile, just outside the rigamaraole, Cortland Finnegan and Stephen Tulloch found each other. Teammates for five seasons in Tennessee, they decided to partake in some good-natured grabbing and pushing of their own. Which led to this great AP photo showing Finnegan and Tulloch with big smiles on their faces, and line judge Shannon Eastin running in all serious-like to break it up. It was a historic and largely invisible debut for Eastin, the first female official to don the stripes in an NFL game. Of course, it didn't happen the way the NFLRA would have liked, but after a massive promotion from working FCS-level MEAC, Eastin worked the sidelines, here we are. How'd she do? No complaints, but there weren't about to be any public complaints. Coaches have been specifically instructed not to criticize replacement refs (though they are free to comment on them as long as it's positive). 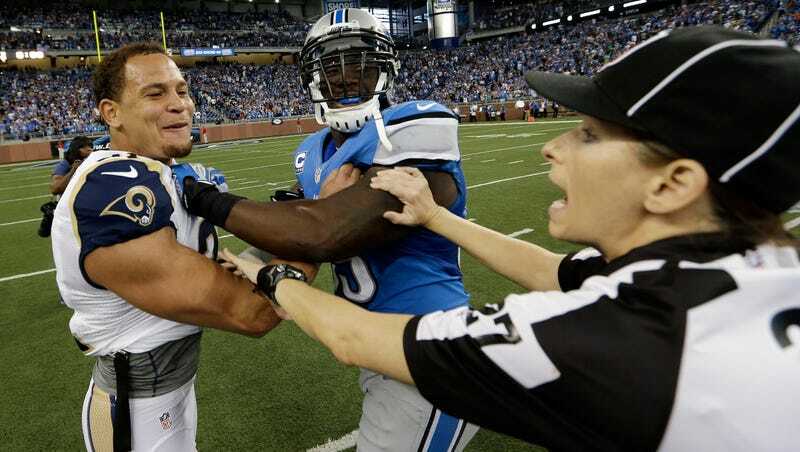 "It's a great milestone," Detroit coach Jim Schwartz said. "But we didn't think about it all during the game." Eastin has 16 years of experience, and runs a refereeing school. But it's an off-the-field hobby that the NFLRA says should disqualify her from working NFL games. She's an occasional participant in the World Series of Poker, and the union says that would run afoul of their strict rules on officials gambling. But she's non-union, and the NFL says she passed a background check, so it's a non-issue. The NFL already handed out Week 2 assignments before yesterday's slate, so expect the same crews to work next week. That means Eastin gets a chance to ref a game that isn't history, and maybe this time not fall for Cortland Finnegan's chicanery.